Can I add custard powder, if yes….what do you suggest should be the quantity? I don’t like to add custard powder to my cookies. I feel it makes them too dry. So I will not advise adding it. Can i use wheat flour ..
You can but it will change the texture of the biscuits. can I replace parchment paper with aluminum foil..as will be baking in convection mode on lower stand..
Have never tried but I don’t see why it shouldn’t work. I tried the above mentioned recipe but the problem which I faced is that butter start melting from dough. And the shape of cookies changed..
Refrigerating the dough for an hour before cutting the cookies should help. 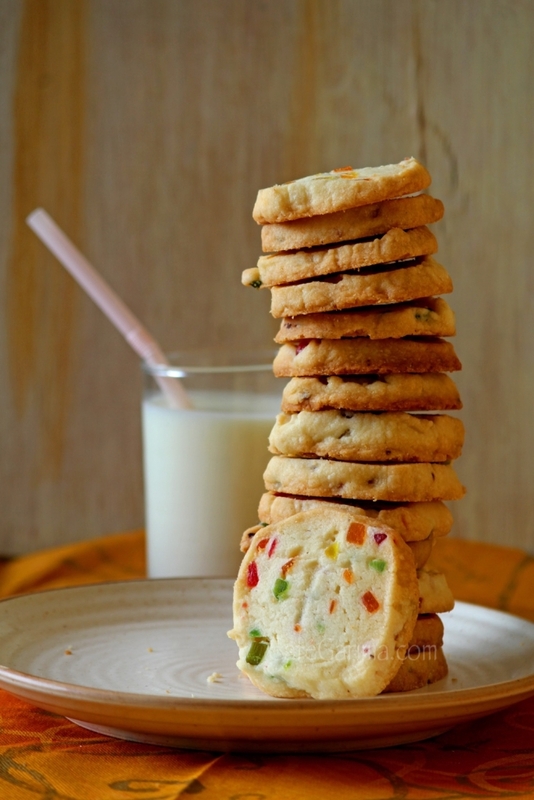 These biscuits turned out real pretty, fragrant, soft yet crumbly and delicious. I tried this recipe but when I placed the biscuits in the oven,they melted and it was too buttery after cooling. Please tell me where did I go wrong? I really wish to make it perfectly and want to try again soon. Try rolling them and putting them in the fridge for half an hour and then baking them straight out of the fridge: sometimes this may happen because of the weather. Yes, I kept the biscuit roll,wrapped in cling film in the fridge for an hour and after taking out,cut it and placed in the oven tray and baked it but it all melted and it was all too buttery. Is it possible that this has happened because i might have used butter more? It is always better to weigh your ingredients and use them. Okay!! Thanks. I will take care of that next time. I dnt hv beater….. S der any othr optn to beat butr n sugar….? 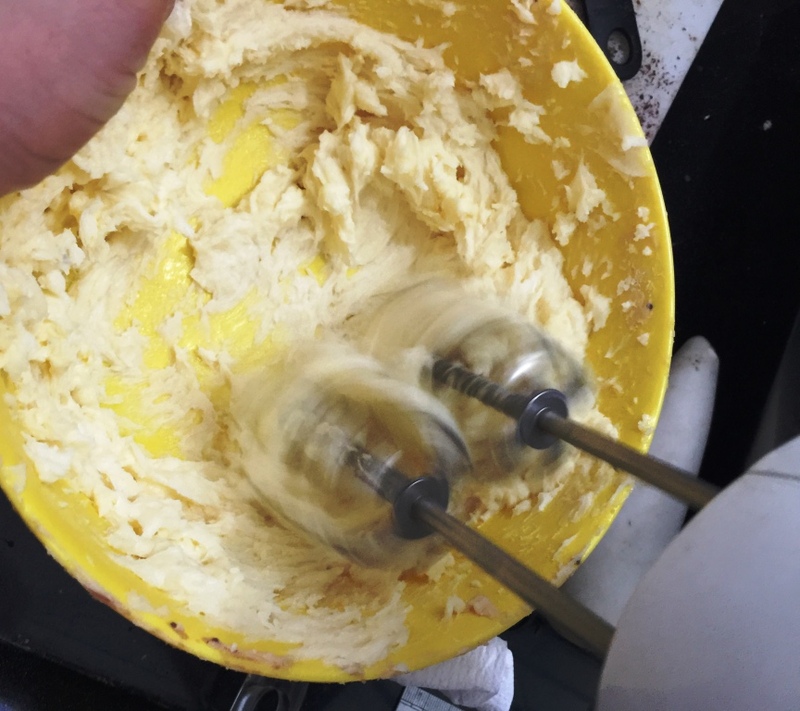 You can beat it with a whisk by hand. 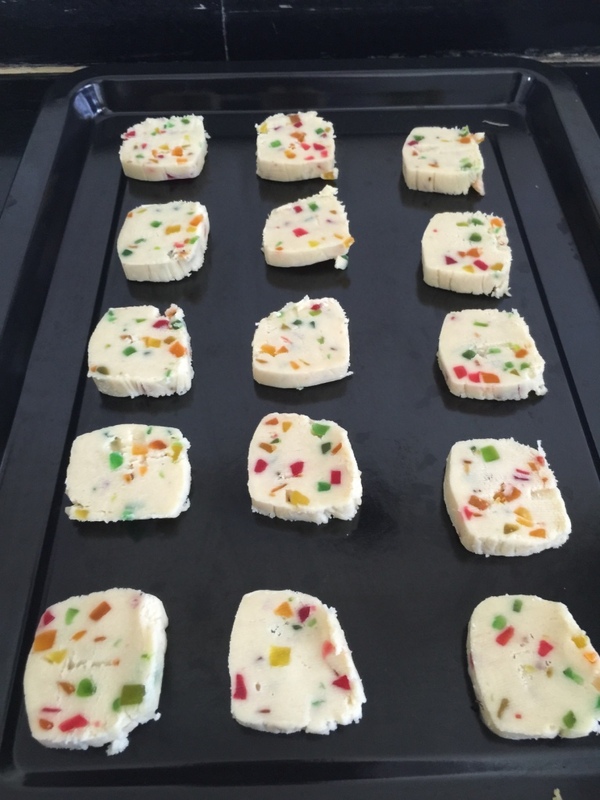 Pingback: Tutti Frutti Biscuits | Hyderabad Karachi Bakery Style | Diwali Special | Bake, Cut and Fry! I bake in an OTG but to my knowledge a convection microwave works exactly like an oven. So I think you should be able to bake them. one quick question, normally Powdered Sugar is a Misused term. Powdered Sugar is with cornstarch and not only a blended sugar in Mixer. So, do you mean to say Powdered Sugar with cornstarch or just a blended sugar to powdered consistency in above recipe? In India we get granulated sugar only apart from icing sugar. We don’t really get powdered sugar in the stores. I do mean sugar that has been powdered in the mixer grinder. Came out good but still not close to what Karachi sells. 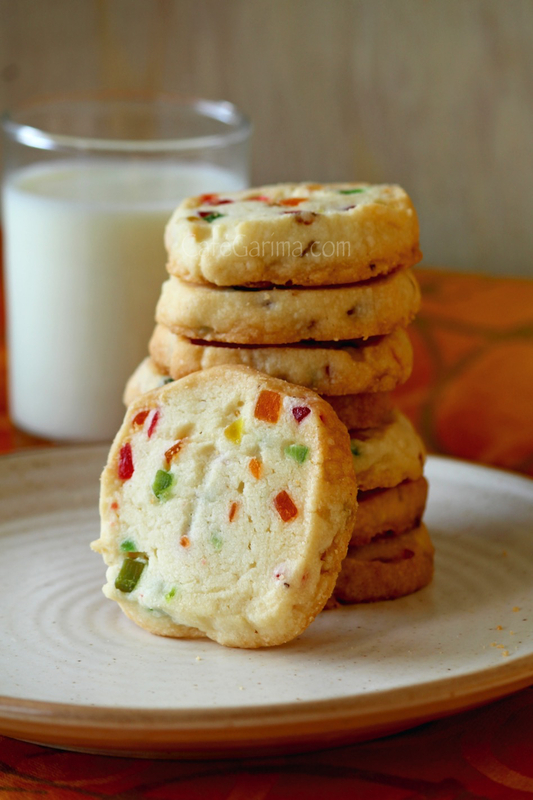 Garima nice to see you have posted hyderabad biscuit recipe here but pls do note not to mistake me as this is not real recipe of biscuit I am Ex. Culinary Chef of Karachi Bakery with 18 years experience over there we don’t ad flavour in it but we get one butter from spain which is imported that has aromatic smell that gives taste to the biscuit those butter are not available in india and I too for my bakery import the same butter from spain if you have that butter you all can do same as it is .. Apart from all online recipes are absolutely wrong. Thanks for writing in. 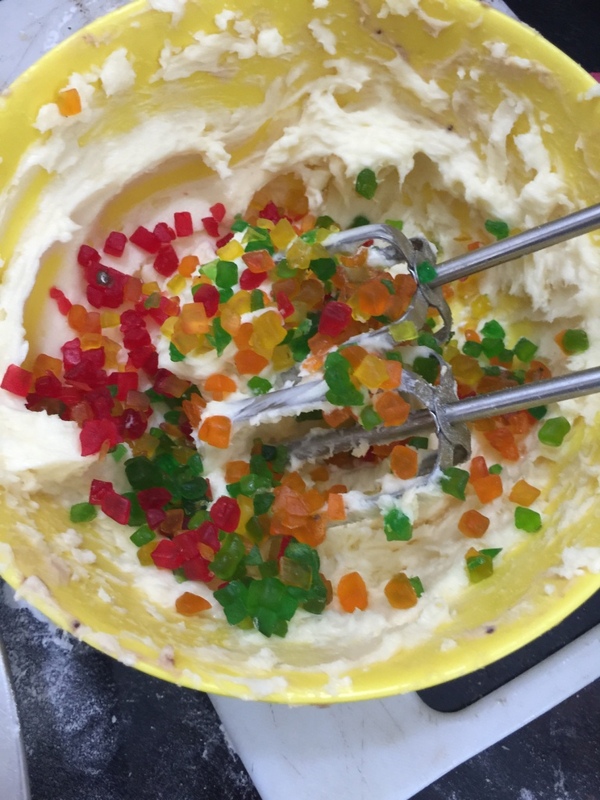 However, I do not claim that it the very same recipe, just that I have tried to bake in the same style with the ingredients I have easily available in my kitchen. I have a digital scale and the brand is Nova. Mine is barely a month old too so I am not the best person to advise here 🙂 I just went to a local store that sells electronics and bought it. It is a Chinese brand but the guy said it is quite Ok. Buy whatever you has available in your city . 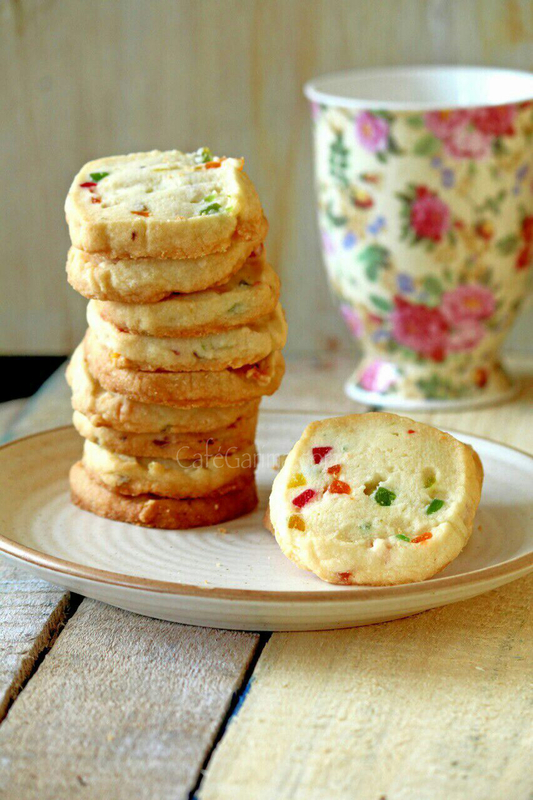 I tried these biscuits and turned awesome..
Can these biscuits be made in microwave on convection mode?? Although I haven’t tried baking them in the microwave, I’m sure they can be done on the convection mode. Whem i kept them for baking, it started melting and started to burn in just 5 minutes. I had refrigerated it properly for more than an hour nd immediately put it for baking. Could you please help with what went wrong? Maybe your oven heats up too much. Try baking on a lower temperature. Can you please tell what is the life of these biscuits? About two weeks they stay good. They have never lasted beyond a week at my place. 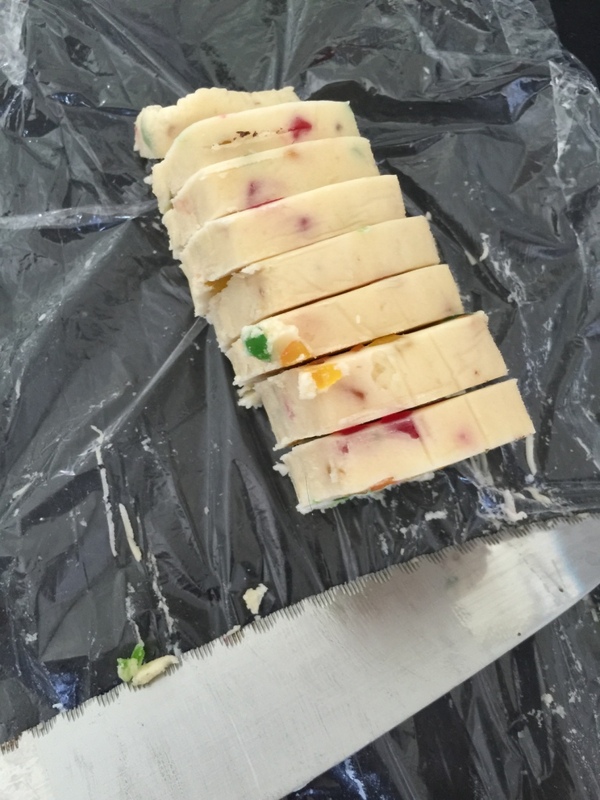 I hve tried ur receipe…nd it turn out ao yumm. I haven’t really tried baking them in anything apart from the OTG. Hello, i tried this recipe. The taste was delecious but the biscuits remain soft in the middle even after cooling them completely. They firm up just from the outside but the center is soft. 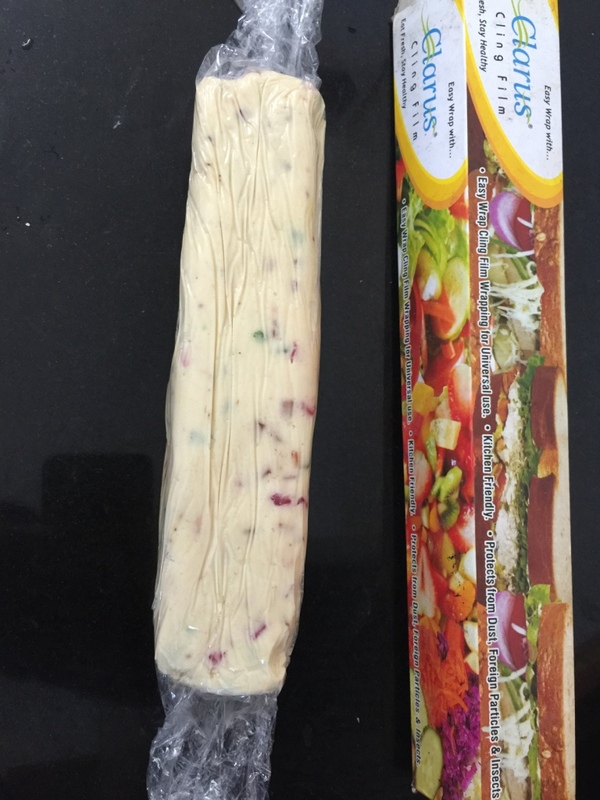 I tried it in both microwave and oven, adjusted the timw, but still it remains soft. Is there any change I can do to make firm in the middle like increasing the amount of flour? If they are cooked through, it is not a problem. Are you sure the biscuits are cooked through? I made these biscuits today. Lookwise they are looking same as karachi biscuits but the taste is not same. May be i did some mistake while making them. 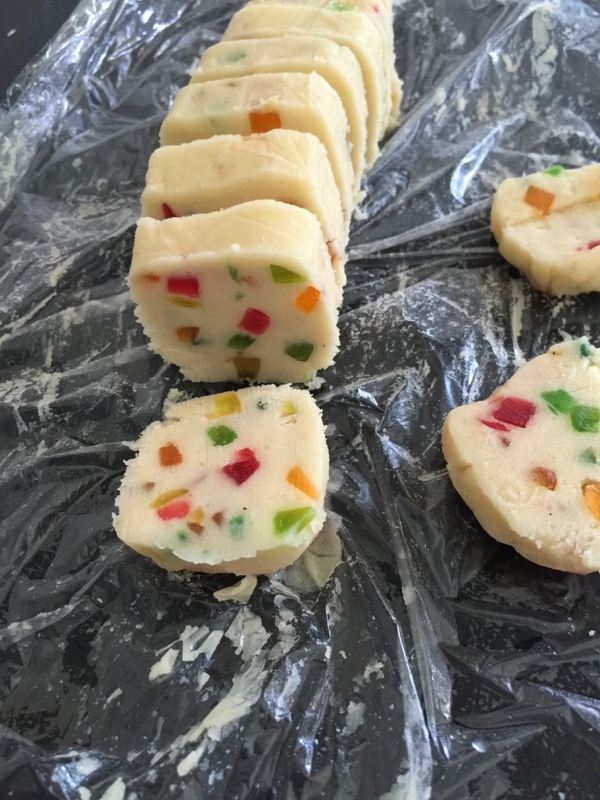 Lots of people have tried the recipe and have been happy with the results. I follow the procedure exactly as I have shared. Hi Garima…. 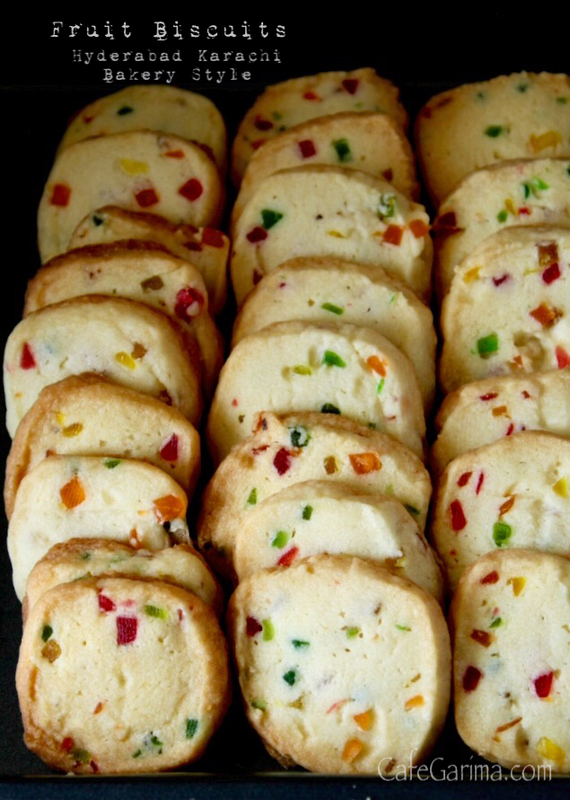 Want to these yummy biscuits…Just one query can I use home made butter which we also call makkhan instead of unsalted butter. 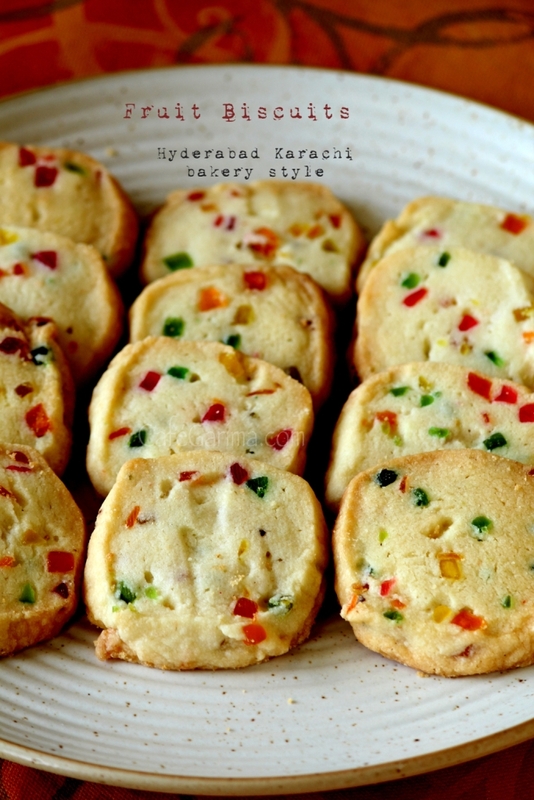 i made these karachi cookies yesterday evening and they came out very well. slightly crispy too. After one hour i kept them in air tight container. now in the morning they have turned soggy. what might be the reason ?please guide me. They are not very crisp. I hope you cooled them fully before storing them. First attempt , followed each and every thing as mentioned above, result was awesome tasty biscuits. Thank you for the recipe. I tried each and every step of the recipe and the result was very nice. 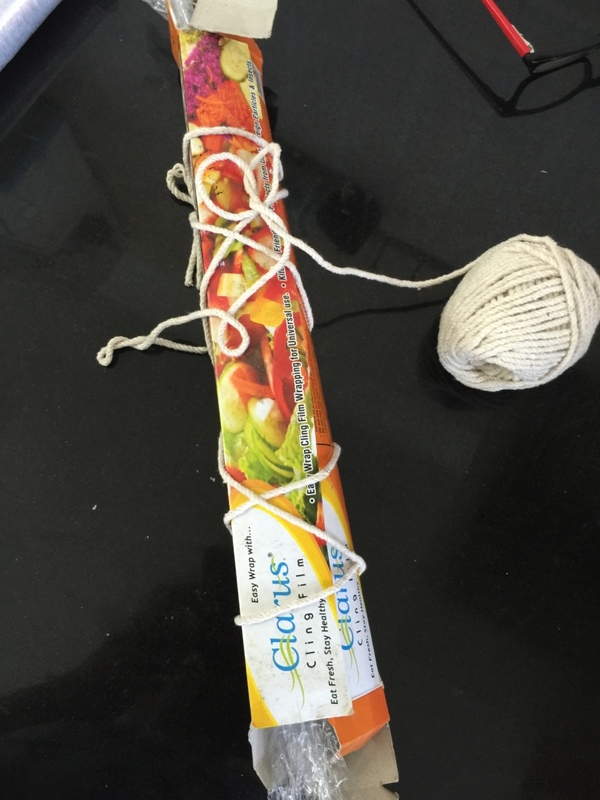 My husband couldn’t believe that I made at it at home! !